Dropbox has done an amazing job building a product that everyone knows and everyone uses and everyone loves. We all use Dropbox to store and share documents, designs and all different kinds of files, so why not websites? duet.to adds a layer on top of Dropbox technology to serve your files on the web maintaining the simplicity of updating your website by simply saving files in Dropbox. The technology behind duet.to is backed by premium CDN servers for availability and faster delivery of your website assets. 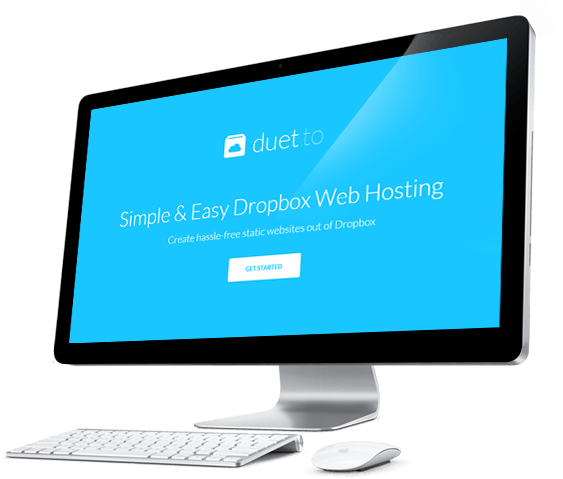 If you're using Dropbox to host your website, it's time to try duet.to, which is a great alternative for Dropbox Public folder since Dropbox made Public folder links inactive, and discontinued the ability to render HTML content in-browser via shared links or Public folder. Deploy and host websites on Dropbox.